Monica Bonvicini's No Head Man, 2009. Installation view of 35 days of film at Mitchell-Innes & Nash, New York, 2018. © Monica Bonvicini; courtesy of the artist and Mitchell-Innes & Nash, New York. Every summer, outdoor venues around the country welcome the public to come and enjoy one of America’s favorite pastimes: the cinema. This summer, the same could be said of Mitchell-Innes & Nash, who have turned their Chelsea space into a movie-going experience in its own right with their exhibition 35 Days of Film. Over the course of the summer, the gallery is showing works created by a select twelve artists working from 1965 to today including Martha Rosler, Pope.L, and Monica Bonvicini. With this show, Mitchell-Innes & Nash wanted to highlight how video is an important mode of creating, which many of their artists have used to discuss histories or build narratives. Many of the pieces in the exhibition are rarely screened or are being shown for the first time. Though the included works were created during different time periods and subsequently different periods of artistic production, each find common ground in their examination of timely issues through the lens of film. In our screen-obsessed culture, this show reads as a re-examination of the screen, specifically the role of our phone screens in today’s culture, and how engagement with these screens can distort our views of reality. Topics such as the politics of labor, motherhood and capitalism’s grasp are explored in the various films, in an effort to explore the medium’s ability to bend time, blurring the boundaries of the present, past and future. Pope.L’s Reenactor, 2012/2015. Installation view of 35 days of film at Mitchell-Innes & Nash, New York, 2018. © Monica Bonvicini; courtesy of the artist and Mitchell-Innes & Nash, New York. Parallels between issues addressed in some of the earlier works can be drawn to today’s political climate. In Martha Rosler’s, If it’s too bad to be true, it could be DISINFORMATION, (1965), the artist examines the deception of broadcast reporting long before the term “fake news” was coined. Rosler creates her own nightly news program, analyzing the confusing syntax intentionally placed in news script. Her analysis of news media serves as a testament to our naivety in believing what we view on a screen to always be fact. Pope.L’s historical examination of the United States’s notions of race, identity, poverty, and nationhood in Reenactor, (2012/2015), brings to light the uglier aspects of America history removed from the narrative and the absurdity of this act. 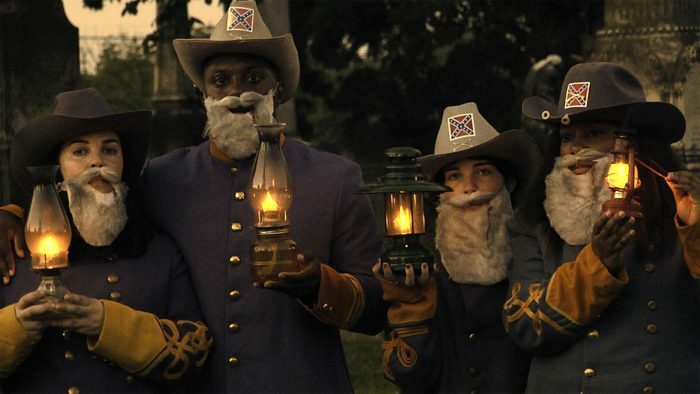 The film follows student-volunteers dawning confederate soldier uniforms, described by the artist as “the most visible and onerous costumes of our historical past.” This group of “reenactors” spend the duration of the film performing everyday rituals such as cleaning and caring for children. Pope.L intends to link the violent history of the South with the normal and mundane of the quotidian. The artist uses the medium of film to address technology’s ability to distort remembrance. As a whole, these films create a narrative of our society’s progression to a screen-obsessed culture and how larger, fundamental issues are easier to ignore as a result. By taking part in the exhibition, the viewer is at once acknowledging their part in the phenomena and their ability to hopefully see past it.